Holy Communion is Christ himself, coming to us through bread and wine. This meal is God’s gift of grace and forgiveness, given for all. Holy Communion instruction is available for kids in Grades K-5. Parents choose the appropriate age for their children to receive communion. Children should complete First Communion by the end of 5th grade to participate in Holy Communion during confirmation in Grades 6-8. Family-Led Learning: Materials for a home-based instruction will be available beginning February 10. Families have the option of joining us for Communion Bread Baking, Sunday March 10, 2:00-3:00 at Madison campus, immediately following Fed & Forgiven group learning class. 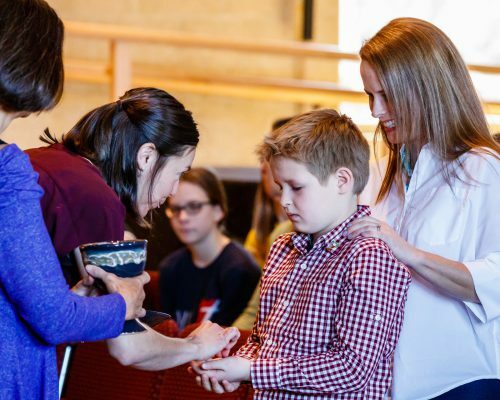 First Communion Recognition: Children may receive their first communion during all worship services at both campuses on the following dates. Maundy Thursday, April 18, 7:00 pm Madison & Verona: For nearly two centuries, Christians have celebrated first communion on Maundy Thursday. This Holy week service commemorates the last meal Jesus shared with his disciples before his crucifixion. A meal that connected His life and His sacrifice back to all the promises God made to humanity throughout history. Children and families are invited to receive communion for the first time at this special, evening Holy Week service.